Our in-kind scheme, which utilises the space we have in our retail assets to support third sector organisations. Each of our retail destinations is encouraged to provide both commercial mall space and retail units to charitable organisations. We have supported a number of organisations with retail unit space. The three featured here are excellent examples of local initiatives that bring enormous benefit to their communities, social and economic. We are delighted to be able to support their activities and those of the many other organisations we provide in-kind space for across the portfolio. Lives not Knives was founded by Eliza Rebeiro in 2007 as a campaign to make people aware of the dangers of knife crime. It has since evolved and now supports young people into education, employment and training. 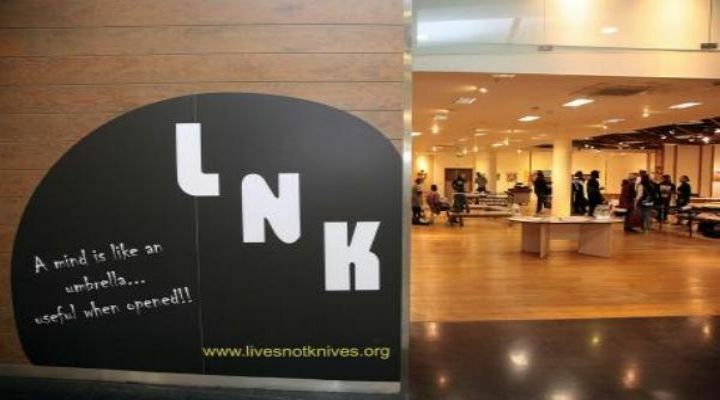 Lives not Knives has occupied a unit withiin Centrale Shopping Centre, Croydon, for over a year, providing them with the space they need to engage local young people. Of the 141 young people supported in the first year of the unit being open, 61 were known to the criminal justice system and 50 of those (82%) have not reoffended since the completion of their work with the programme. This is an enourmous achievement and one we remain proud to support. 109 of the 141 young people were able to secure full-time education or employment. 34 young people were leaving care, 25 of them have secured either full-time education or employment. Of the 55 young people in this breakdown, 53 are now in full-time education, providing an estimated annual saving of £157,016 in public spending. In the run up to Leeds Pride in August 2018, Victoria Leeds hosted a captivating exhibition of photographs in collaboration with local street artist Jonathan Straight. Spearheaded by the Victoria Leeds Sustainability Team, the exhibition allowed the centre to participate in the city’s Pride celebrations and provided an opportunity to engage with their 2018-2019 charity partner, the Bone Cancer Research Trust (BCRT). Over the six-week exhibition, 2,000 visitors experienced the photography series. The exhibition was the result of a collaboration with a range of local stakeholders and offered something new and engaging to the shopping centre's customers. This project is part of Victoria Leeds' on-going support of the Bone Cancer Research Trust, which has included the completion of the Yorkshire Three Peaks challenge in July which raised £1800. Later in August the centre also hosted a performance by Yorkshire born artist and songwriter, Curtis T. Johns, which further supported fundraising efforts and creating a buzz in the centre, evidenced by the increase in footfall. CVA is the umbrella organisation providing support to over a thousand voluntary and community organisations in the Croydon area. They provide support on the many practical administrative and organisational elements necessary to make a local voluntary group work. This includes setting up, charity registration, fundraising, finding premises, marketing, financial management, policies and procedures and much more. Not exciting maybe but fundamental. They also provide training in a full range of subjects to meet the needs of small new voluntary groups and social enterprises as well as large established charities. As well as enabling groups and individuals to access appropriate funding to support local communities, Croydon Voluntary Action’s Capacity Building Service helps not for profits to develop their capacity to sustain themselves longer-term AND to run as effectively as possible. CVA have occupied a unit in Centrale Shopping Centre, Croydon since 2013, providing them with the space they need to accommodate the training and support they deliver. 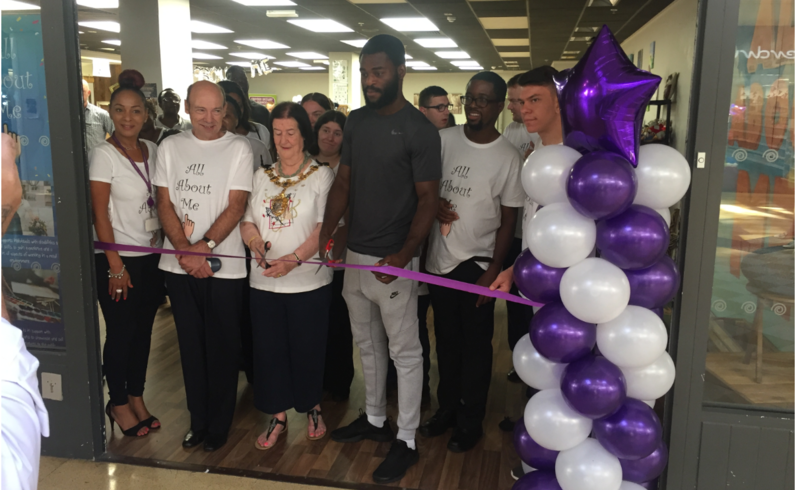 “All About Me” was a unique pop up boutique initiative developed by Croydon Council’s Gateway Employment Service with Croydon Partnership (Hammerson/ Westfield joint venture) support. Gateway Employment Service supports people aged 16+ with learning disabilities, physical disabilities, sensory impairments, mental health needs and autism. Over a four week period, an empty unit was transformed into a high quality boutique style retail space selling a range of products and merchandise from local charities, organisations and groups. Unit space was provided in-kind, with a £1,000 Croydon Partnership grant award providing financial assistance towards the cost of fitting out the boutique and marketing collateral. Overseen by a boutique manager, all those employed at the boutique were clients supported by Gateway Employment Service. In addition to gaining valuable retail and customer service experience, through training provider based on-site, eleven boutique employees trained “on the job”, gaining an NVQ Level 1 Retail.